I don’t carry a purse. Before I get into why, here’s a little history. I’ve been carrying a purse, or some kind of bag, most days of the week, for 30 years. It started around age 10 when my schoolbooks became too heavy and numerous to carry in my arms. At that time in the 1980s, huge fabric tote bags emblazoned with Le Bag (remember those?) were very popular. I couldn’t afford one so I had to settle for a knock-off from Gemco or Kmart that was printed with many different sayings in French. I think that’s when my bag-envy and love of big bags and purses began. I’m now 41. And I’ve owned many purses and bags. I’ve also suffered from right shoulder and upper back pain for many years. My massage therapist would tell me, try switching your purse from one shoulder to the other every once in a while. I tried. But the pain persisted. Years ago, I considered not carrying a purse but the thought of not having my wallet, lipstick, lip gloss, mirror, Kleenex, water bottle, pad of paper, pen, hard candy, etc. close by at all times made me panic. Then, one day, I got sick of carrying it all. Maybe it was because I was tired of having to transport everything every time I changed purses. Maybe I was having a bad day. I can’t remember why. I just knew I didn’t want to do it anymore. In the photo above, you can see what I now carry when I leave the house. Loose change goes into one of my jean pockets. Cashiers love me because I almost always pay with exact change. 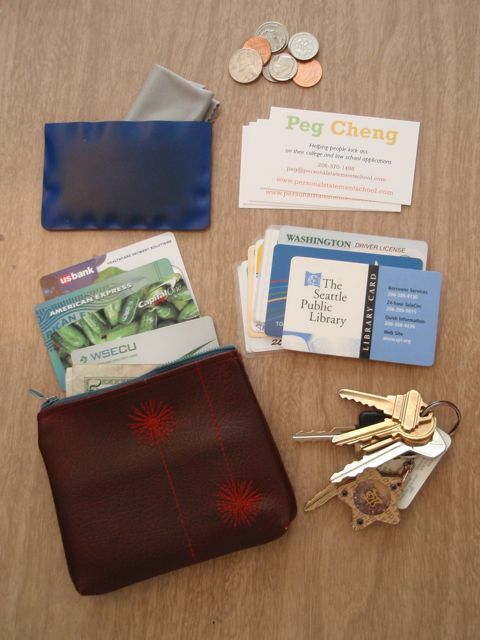 In one of my jacket pockets goes my zip-up wallet that holds my cash, credit and debit cards, driver’s license, bus card, library card, car and health insurance cards, and business cards. Also, tucked into my wallet is a plastic sleeve with an eyeglass shammy inside (in case you haven’t heard, it rains a lot in Seattle). In my other jacket pocket I carry my keys and a Kleenex pack. Usually I bring my phone in the same pocket as my keys, but not always. I know some of you are gasping right now. I don’t always travel with my phone and yes, life still goes on. I haven’t carried a purse for five months. Guess what? No more shoulder and upper back pain. I still love purses. They are beautiful objects of craftsmanship. I usually carry one when I’m traveling (maps don’t fit well in my pockets), when I’m teaching (looks more professional to carry my handouts, business cards and dry-erase markers in my bag), or when going out to an upscale event (why doesn’t someone make a chic evening dress with pockets? ), but I no longer carry a purse every day. I am so sorry to hear that your car was broken into and your purse was stolen, Danielle! That’s really terrible. I can see why you might want to stop carrying a purse. I see from your site that you are a 25-hour-a-day mom. Awesome name for a blog! I am not a mom but from the moms I know, they all carry purses. And I can understand why with all the things you might need for yourself and your kid(s). It’s a balance that every woman has to determine for herself. Let me know what you think of the purse-less life. I’d love to hear how it goes for you!